* This is a review of the solo variant of Raiders of the North Sea not a review of Raiders of the North Sea. The solo variant is plays very similarly to a standard game of Raiders of the North Sea. Setup remains the same as a 2 player setup. Your opponent does not require the normal start up Silver, Townsfolk cards, or worker. You take the first turn as you would in a standard game. Your opponent follows by playing a scheme card. The expansion comes with 23 scheme cards. At the beginning of your opponents turn, you turn over the top scheme card. They will always choose to raid if they are able to. The scheme cards have Armor strength, and required Provisions listed at the top. If there is an available set of Plunder at the location on the card, along with your opponent have the required Armor strength and Provisions in their possession, they will raid. A raid is carried out by returning the required Provisions to the supply and moving their score marker the required number of points on the victory points track. They take the Plunder from the location. If a Valkyrie is taken they move their Valkyrie token on the track and down one Armor on the track. The Valkyrie, Plunder and the worker are returned to the supply. If the opponent is unable to complete a raid, they will work. The scheme cards also have Armor, Provisions, or an Offering Tile to gain while working. The last thing on the scheme cards in a Village location on the bottom of the card. Regardless of whether your opponent raided or worked, the listed location is blocked in your following turn. The game ends the same as it would in a standard game. WOW! I'm not sure I could love this variant any more! When I received the variant, I was surprised by it's small compact size. It initially worried me about how good it was going to be while playing. With only 23 cards, it fits easily into the standard box. As I broke out the game and dug into the rules, I realized there was a lot of information and possible playout on the cards. The rules were easy to understand and I was able to start immediately. The scheme cards are well laid out and easy to understand. I absolutely loved that the solo variant felt like I was playing a standard game of Raiders. I loved that there were options for the opponents turn depending on their current state in the game. 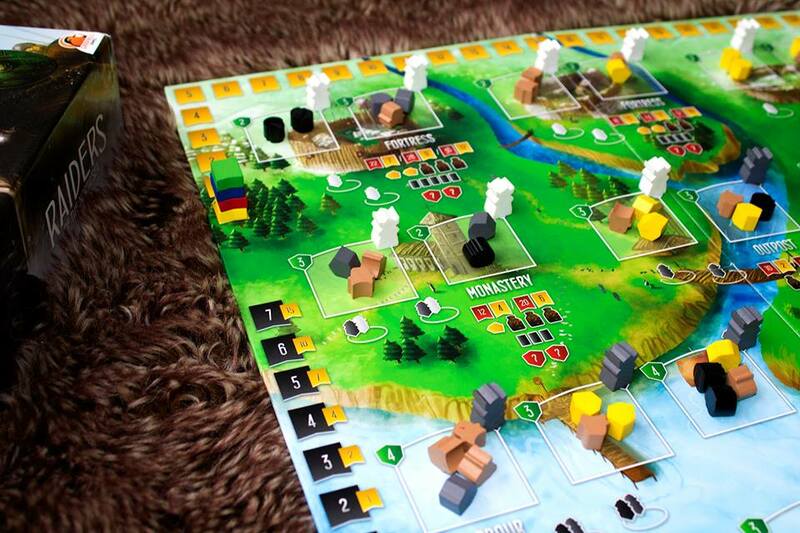 If you are fan of Raiders of the North Sea, and enjoy playing solo game, this is a must buy!